Happy Halloween! I wish you all a happy and safe evening of fun! I know my kids are SO ready to get out there and Trick or Treat. Can you believe October is over? I love Fridays.... and I love Beate's Sketches! This one was REALLY fun. I stamped the flowers on whisper white card stock, then loaded up my Copic Airbrush and sprayed R85 all over. I then took the marker out and colored the flowers. Of course I couldn't have plain ole flowers now that I have Shimmerz, so I gave them some Shazam with Bubble Gum Pink... man, I love that stuff. I'd bathe in it and go out for Halloween if I had enough! Can you see me now? All pink and shimmery head to toe? I'd save the new product for my hair. (yah, they are coming out with a new product.... but I can't tell you yet). But you can go over to their blog and get a chance to win some! See the huge fonts in the previous post. LOL. I also added some Crystal Effects to the owl's eyes and a black nose with my Sakura Glaze pen. Stamping is SO much fun... isn't it? Don't forget to check out what the rest of Beate's team is up to. I can't wait to check it out! Here is this weekend's sketch.. it's number 64. Hope you can find some time to play along with us over the weekend. Paper: Chocolate Chip, Pumpkin Pie, Whisper White, Sweet Always Designer Paper. Ink: Brilliance Coffee Bean, Copic Markers. Other: Gingham Ribbon, Circle Nesties, Cuttlebug, Crystal Effects, Bubble Gum Shimmerz, Paint Brush, Dimensionals, Sakura Glaze Pen, Janome Sew Mini, Scor-pal. Have a great weekend!! Eat some chocolate baby. So, what's your favorite? You know.... the one you look through your kid's stash for? I think it's the Reese's for me. I don't know though, I also LOVE the dark chocolate with almonds too... dang, it's all so good. I totally DO not need to be eating the candy, but it's Halloween right? You HAVE to... right? I TOTALLY SPACED THE BEST BLOG CANDY EVER!! Shimmerz is coming out with a brand new product!! Oh yah baby... don't these guys just make you smile? They make me grin every time I see them. Love that little guy peeking out of the water. You can see it in the photo, but the water hole is covered using with my clear Sakura Glaze Pen (my friend Nancy got me hooked on them all over again.) Their eyes too... they have just a dab of the black Glaze Pen to make em pop. LOVE those pens! It's like embossing without the mess. Okay, so yesterday was horrible. Just when I thought I was feeling better, I woke up with the WORST headache. I got the kids on the bus, went back to bed and didn't even get up until 12:30! Slept the day away, but later in the afternoon my headache finally left and now I feel a ton better. So, I KNOW the rest of the week is going to be good! Averie is SO excited for Halloween this year. She hasn't decided for sure what she wants to be... it changes daily. One of my twins wants to dress up as a girl! I can't wait to put makeup on him.... he's such a goofball. I guess I better get up in the attic and get down the costumes huh? Wow, hard to believe it's only a few days away. What do you do for Halloween? Do you take the kids out, or stay home and hand out candy? Shoot... I guess I better get some candy too. Man, are they days just zooming by or is it me? Paper: Chocolate Chip, Neenah White, Pumpkin Pie, Pumpkin Pie Patterns Designer Paper, Prism (baby blue dark). Other: Sakura Glaze Pens, Nesties, Cuttlebug, Orange Striped Grosgrain Ribbon (SU! 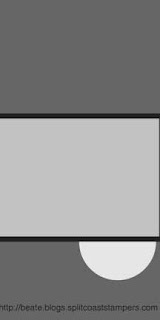 ), Dimensionals, Scor-pal. Hello stampers! Today, easy is good. 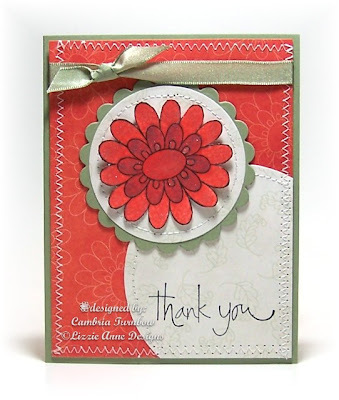 :) I love this new set from the Stampin'Up! Mini called A Happy Heart. It indeed, makes me happy! 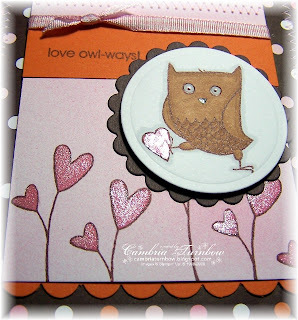 I used my all time FAVORITE pink pirouette card stock for the base, stamped randomly with the little Feb 14 stamp with Pretty in Pink classic ink. The frame is made with the Square Nestabilities. Did you know that you can stack them to together, run them through your Cuttlebug and get a perfect frame? I did not know that and was thrilled to discover that this morning. I added some SHAZAM to my card with my Sakura Glaze pens. 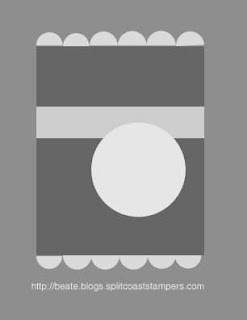 The black is all raised up as if it were embossed and the center heart has a clear glaze on it. To add a tad of glitter, I got out my atyou Spica Pens. 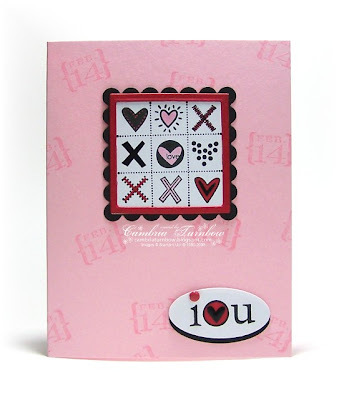 I added the little I (heart) you at the bottom using my small oval punch and dotted the i with a Real Red brad. Paper: Pink Pirouette, Basic Black, Whisper White, Real Red. Ink: Ranger Adirondack Pitch Black, Copic Lipstick Red, and Rose Pink (R29, R81), Pretty in Pink classic ink. Other: Small Oval Punch, Crafter's Tool Kit, Real Red Brad, Nestabilities, Cuttlebug, Sakura Glaze Pens, atyou Spica Pens. Hope you have a wonderfuly day... thanks for stopping by! Do you use a crock pot? If so, check out this blog.. Okay, so Harley Dee... come on down baby. YOU WON!! Please email me at cambriaturnbow@charter.net. and I will send off your new stamp sets! And, YES, I do have a crock pot which I LOVE. Thank you SO much for all the awesome recipes! I cannot wait to try them! Oh man, speaking of love, you guys are THE BEST. I was feeling pretty horrible this weekend... it seems the bug finally caught MOM. No puking though.... whew! Isn't that how it goes.... you get everyone else feeling better then WHAM? So, all of your sweet comments MADE MY DAY! Seriously, I was grinning ear to ear. I'm still grinning... you are THE best! Thank you for forgiving me! Okay, so believe it or not, I'm stampin today. I'll be back later to post a card! Whooo Hooo! This is going to be a good week, I can feel it! Hey everyone! Happy weekend! Today I'm offering up some "please forgive me for being a bad blogger blog candy!" 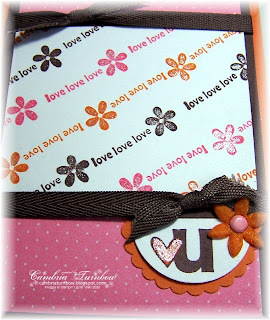 Blog candy includes two sets from Stampin' Up! 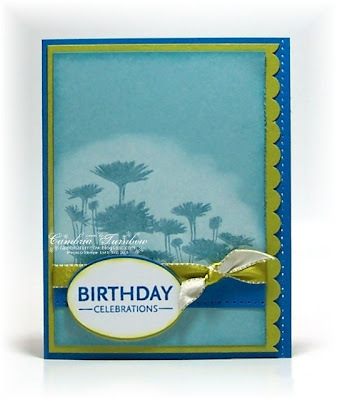 Organic Grace hostess set, and Many Happy Returns stamp set. You get both! Please leave a comment (favorite quick easy recipes are always appreciated), by Monday, October 27th by Noon Pacific. Hey everyone! Wow, it's Friday again, and another week went by with no posts from me... I'm so sorry. If it's not one thing, it's another for us lately. Yesterday we spent the day in Eugene where my oldest son went through allergy testing. He is allergic to grass, dust mites and household dust. So, now we know what's setting him off and hopefully we have his meds right so that he can quit missing school. Poor kid. Allergies are horrible! No one in my family has ever had them, so this is all new to us. Yah, DUST... can you believe that? So much for letting my pile get so bad you can write in it. And, so much for having him do dusting as a chore! How bad is that for Mom? So, let's hear a whooo hoooo for Friday and the weekend! And another for Beate's Weekend Sketch!! Here is the sketch and the sketch team... hope you can play along over the weekend! Paper: Pretty Papers (Lizzie Anne Designs), Riding Hood Red, Basic Black, Neenah White. Other: Circle Nesties, Cuttlebug, Angel Wings Shimmerz, Fun Flock, Quickie Glue Pen, Dimensionals, Ribbon (retired SU! 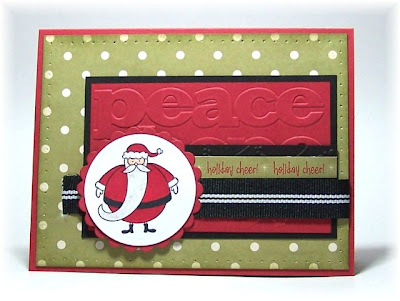 ), Holiday Embossing Folders and Borders, Crafter's Tool Kit, Scor Pal. Hope you all have a great weekend. I'm putting together some "please forgive me for being a bad blogger blog candy" this weekend, so stop by if you can for your chance to win. Thanks for stopping by! Good morning everyone! Happy Friday! I made Beate's Weekend Sketch! A little late (I'm so sorry), but I made it. This card is a regular 4 1/4 x 5.5 card except I cut an inch off the side... so really it's 5x5 x 3 1/4. LOL. 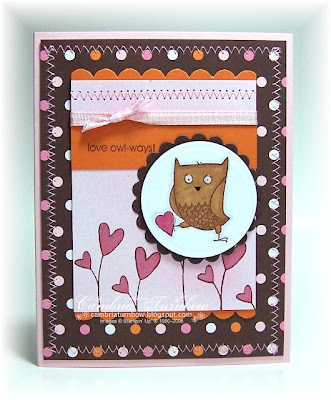 I used the new set from Stampin'Up! called You & Moi. Hearts and flowers.... they get me every time. Ink: Chocolate Chip, Pumpkin Pie, Regal Rose. Other: Shimmerz, Chocolate Poly-Twill Ribbon, 1 1/4 inch Circle Punch, Marvy Round Scallop Punch, Paint Brush, Flower Fusion, Crafter's Tool Kit, Pink Brad, Scor-pal. Here is the sketch... hope you can play along! Okay, so I'm sure you can probably imagine that since I've been such a BAD blogger this week, that it's been crazy at my house. THANK GOODNESS I have not puked or even felt bad (knocking on wood... REALLY HARD), but almost everyone else in the house has.... including my puke cleaning man. :( I think everyone is done now. My oldest went back to school today because he's worried about getting behind in work (he is getting straight A's). So, we'll see if he makes it all day. Averie went back too, after she's been home all week. Not really feeling bad, but she had a really nasty cough and they all had early release for conferences and her class spend most of the time at swimming lessons. I did not want her in the pool with that cough. Although today, she begged and begged to take her swim suit. I caved... she didn't cough last night and seemed much better this morning. So, that's it... sorry for being a slacker. I will try and make up for it this week. Thanks for all the nice comments and emails. I miss you guys!! :) Have a great weekend and thanks for stopping by!! Hey everyone! TGIF! It's been a long week and I'm ready for the weekend. The kids are home today from school for a In Service day, so it will be a long weekend too. One of my twins was really sick this week, so I didn't get a lot done at my stampin desk. I think he's on the mend, and I'm just hoping no one else comes down with it. ... especially ME, because there is NOTHING worse that blowing chunks. I'm not kidding, I think I'm puke phoebic. Man, I tried to clean it up and I end up hurling with the kids. Thank goodness for my man...... my puke cleaning man. Oh, I how I love him...... sorry, I'm WAY off topic. Yah, it's late... yah, I put the sketch off this week... I know, I just busted myself. It's a super cool sketch this week... don't ya think? 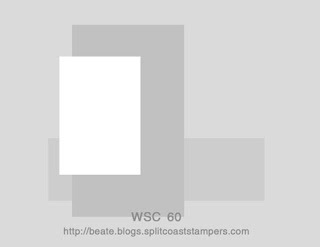 Make sure to check out Beate's Weekend Sketch! And, don't forget the sketch team...they rock! Paper: Pretty Papers (Lizzie Anne Designs), Mellow Moss, Neenah White. Other: Shimmerz (Pumpkin, Rustic Red) Circle Nesties, Cuttlebug, Mellow Moss Taffeta Ribbon, Janome Sew Mini, Scor-pal. Have a great weekend everyone! Hope you can play along and stamp with us! Hello everyone! Hope you had a great weekend. Today I'm going to share the third project we did at my last workshop. This is a super easy, super fast, but cute little gift card holder. My friend Pinie shared this on her blog back in March. She received one in a Control Freak swap from Erin Blair. Thanks girls! Okay, so I know it's not SUPER Christmas like, but I don't have any of the new Christmas paper yet. And, even though it's not "Christmas" paper, I'd totally send it as a gift for the holidays. Gift cards are THE BEST thing to give. Man, my kids love getting iTune cards. I love getting Starbucks or Human Bean Coffee cards, heck, doesn't everyone love gift cards? You could totally dress this up if you wanted to make it really special. 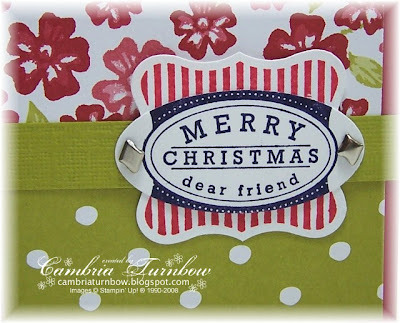 Add a main stamped image, run some ribbon under it that ties on the side. The possibilities are limitless. But, this one was super easy ... just think how many you could whip out and be done with your list of gifts to give? Oh yah baby. Tape that inside portion on the sides only. 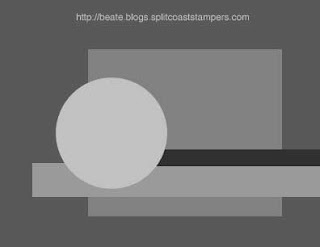 Fold the front and back flaps back and insert the center end into your Tabletop paper cutter. Slice off that center fold. 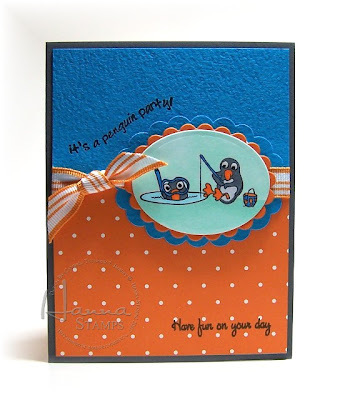 Take the Designer Label punch and insert half way to make a little slot to pull the card in and out. 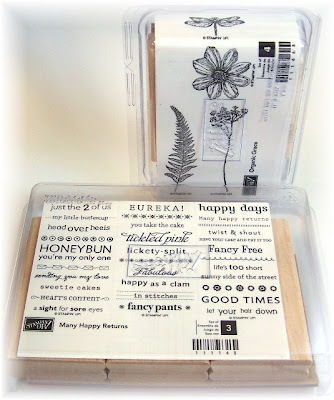 Stamps: Curly Label Bundle, Snowflake Roller Wheel (the inside). Paper: Riding Hood Red, Bella Rose Designer Paper, Whisper White, Textured Kiwi Kiss. Ink: Basic Black, Riding Hood Red. 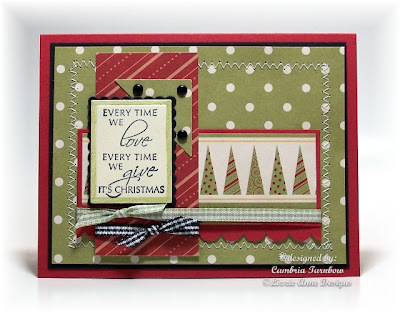 Other: Curly Label Punch, Large Oval Punch, Vintage Brads, Crafter's Tool Kit, Designer Label Punch, Scor-Pal. Have you started on your Christmas card making yet? It's the perfect time to get a head start! Today only, you can get a special deal over at Lizzie Anne Designs. 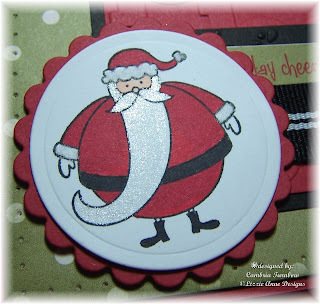 Check out Santa's Cardmaking Workshop and get an extra discount today only!! 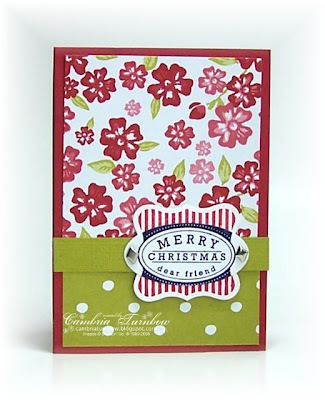 Plus, you can get directions and samples of beautiful holiday cards to tickle your inspiration. 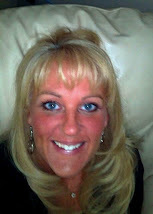 Don't forget to check out Meridith's and Tricia's blogs for some blog candy!! Have a super weekend.... hope you find some time to stamp!! Happy Friday Stampers! You know what Friday is..... it's Beate's Weekend Sketch Challenge! Whooo Hoooo! And the rest of Beate's sketch team... I can't wait to see what they did! 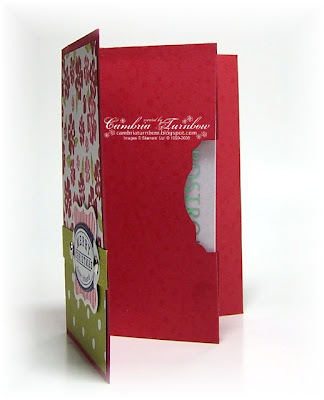 Paper: Pretty Papers (Lizzie Anne Designs), Riding Hood Red, Basic Black, Vanilla Shimmery White. Other: Photo Corner Punch, Nesties, Cuttlebug, Dimensionals, Gingham Mellow Moss and Black Ribbon, Scallop Edge Punch, Green Olive Shimmerz, Paint Brush, Janome Sew Mini, Vintage Brads, Scor-Pal. I hope you all have a great weekend. We are suppose to get a lot of rain and wind... perfect weather for stampin right? As always, thanks for stopping by!! Good morning stampers! 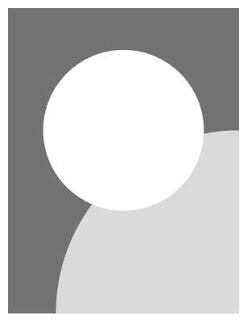 Today, I'm sharing one of the other projects we made at my class last weekend. My girls loved this one. Paper: Baja Breeze, Whisper White, Pacific Point, Kiwi Kiss. Ink: Versamark, Pacific Point, Kiwi Kiss. Other: Versamark, Clear Embossing Powder, Embossing Gun, Crafter's Tool Kit, Scallop Edge Punch, Wide Oval Punch, Dimensionals, Embossing Buddy, Kiwi Kiss Ribbon, Sponges, Daubers, Distress Tool. PS.... join us in the Hanna Member Forums to see who won the Hanna Blog candy!